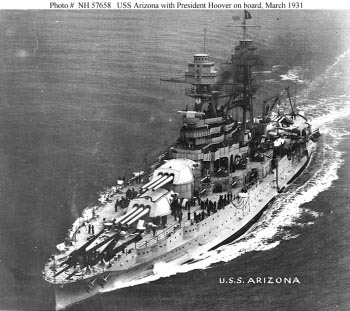 The Arizona was a battleship of the Pennsylvania class anchored at Pearl Harbor on the morning of December 7, 1941. She was one of two battleships lost in the attack that were never recommissioned, the other being the Oklahoma. As seen in this photograph, the forward magazine of the Arizona exploded after a bomb hit near Turret No. 2. Over a thousand men were killed in the explosion. No trace of the bridge crew was ever found, except for the captain's class ring, fused to the rear bulkhead of the bridge. The exact cause of the explosion remains uncertain, but it is clear that the forward magazine exploded, and that a bomb did not go down the stack into the boilers (a myth disproved by the intact screens in the stack.) The film from which the above photograph was taken shows a small smoky fire breaking out immediately after a bomb hit near Turret No. 2, and the main explosion taking place about seven seconds later. 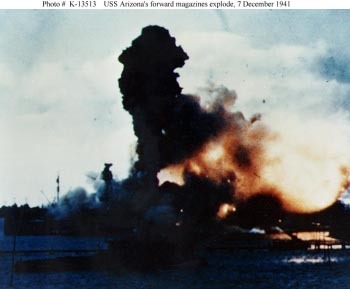 The Navy concluded that most likely the bomb ignited some kind of petroleum fire, and that burning petroleum ran into a small magazine containing black powder for the seaplane catapult. Black power is notoriously unstable, and its detonation triggered the detonation of the main magazine. 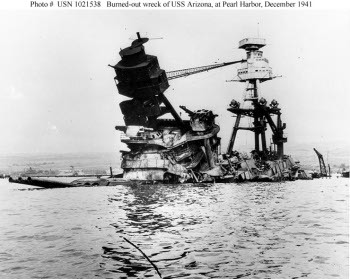 It is noteworthy that, by the end of the war, most United States battleships and cruisers had removed their seaplanes and the associated gasoline and black powder stores because they had proven much too serious a fire hazard to be worth their modest reconnaissance value. 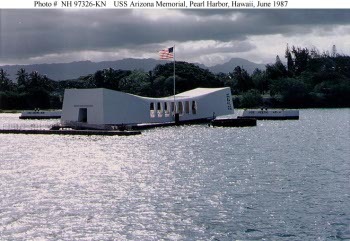 Arizona still guards the bottom of Pearl Harbor today, along with most of her crew. A beautiful memorial has been built over the sunken ship as a reminder of the cost of unvigilance.